A scheme is under way to preserve three highly-threatened species of butterfly across Devon, Somerset and Cornwall. The Reconnecting the Culm project and The Two Moors Threatened Butterfly Project will channel the work. 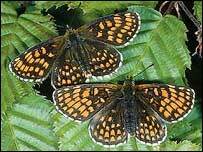 The plan is to conserve to save the High Brown Fritillary, Marsh Fritillary and Heath Fritillary species. Between 1970 and 1982 these species declined by 82%, 68%, and 38% respectively. The Environment Agency is putting £10,000 into the two projects. Other species ranging from dormice to otters and barn owls to reed buntings should also benefit. A project officer will be employed for each initiative for the next four years, based at the English Nature offices in Exeter. Dr Martin Warren, of Butterfly Conservation said: "The West country is one of the last remaining strongholds for these beautiful butterflies and the work will lead to habitat improvements for a wide range of moorland and grassland species." Roger Goulding of the Environment Agency added: " We are very pleased to support these projects which are working to halt the decline of these highly-threatened species."